Obesity is a huge problem in dogs that WILL shorten your greyhound's lifespan. Unfortunately about 33 percent of pet dogs are overweight. We have gotten so used to seeing overweight dogs, that most of us prefer not to see or feel bones. Most breeds of dogs are shown slightly overweight, so that is what we see on the TV dog shows and is what people think their dog should look like. Your vet may not mention your pet's weight problem until it approaches obesity and is causing health problems. 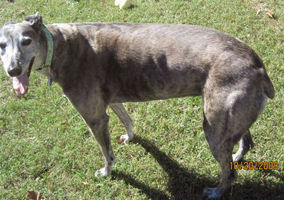 Because Greyhounds are supposed to look a lot thinner than most other breeds, it is a bigger problem for them. If your greyhound looks "healthy" to most people, it will be anything but. When you have a greyhound, you have to be prepared for strangers to tell you your dog is too thin and take it as a complement. 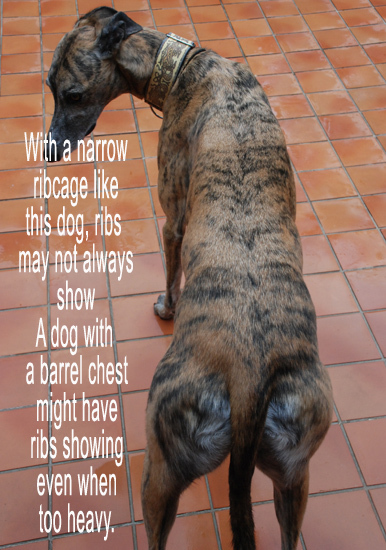 Freshly retired large male at a healthy 80lbs Same greyhound at an obese 95lbs, notice some ribs still show. It is dangerous to race a fat greyhound. Making sure a greyhound is racing at the proper weight is something that trainers and track officials take seriously. Greyhounds are weighed before every race and they must be within a pound and a half, either way, of their set racing weight, or they will be scratched from the race by racing officials. Like human athletes, it is better for them to run thin, than slightly overweight. It is also better for your retired greyhound to be on the thin side, than overweight. Occasionally we do run into a greyhound that did race too thin, like the one below, that just couldn't keep weight on at the track. Most greyhounds are at their fittest and most athletic when racing and our goal is to keep them in that condition their entire lives. Unless your retired greyhound continues to participate in performance events like lure coursing or agility, it will lose a lot of muscle when it retires from the track to a couch. That muscle will be replaced by fat. 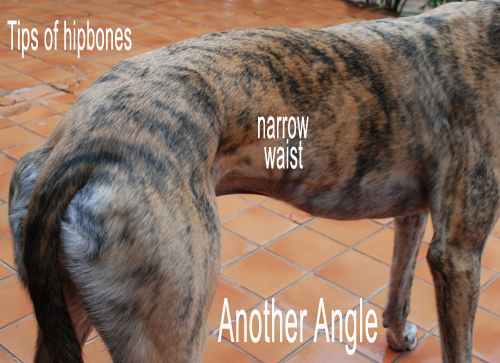 Muscle is heavier than fat, so replacing 5lbs of muscle with 5lbs of fat will make your greyhound look less bony, even if it doesn't gain a pound over it's racing weight. Some very muscular racers can look overweight after they lose all that muscle, without actually gaining a pound. Unless your greyhound was exceptionally thin at racing weight it is best to keep him within a couple of lbs of his racing weight for the rest of his life. "Pet weight" should be thin and fit, not fat and flabby. 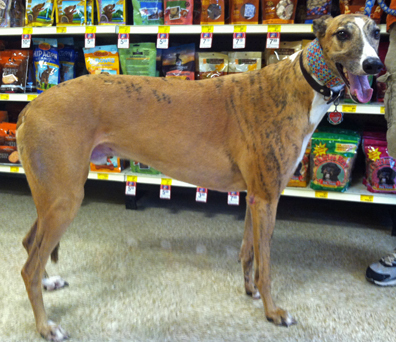 Retiring from racing and becoming a pet doesn't mean your greyhound should gain 10lbs and be fat. 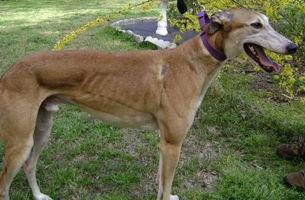 As greyhounds get older and more lazy, they naturally lose even more muscle mass. Senior greyhounds can be hard to keep weight on. 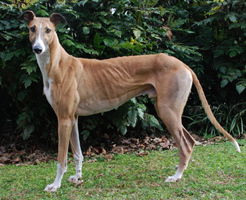 Be aware that as your dog ages and loses muscle mass, its' ideal weight is likely to fall below racing weight. If your older dog loses a significant amount of weight quickly it could be a sign of a health problem and should be checked by your vet. Racing weight should be 60lbs, too much hipbone at 58lbs Same dog at an obese 80+lbs. Those are fat rolls, not ribs! 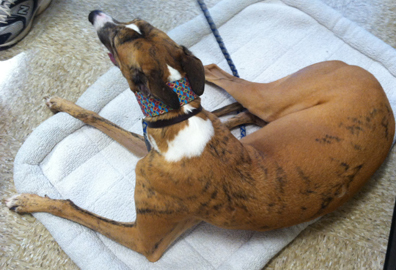 You are putting your greyhound's health in jeopardy by letting it get fat! If it has passed the obese mark, it is in serious trouble. 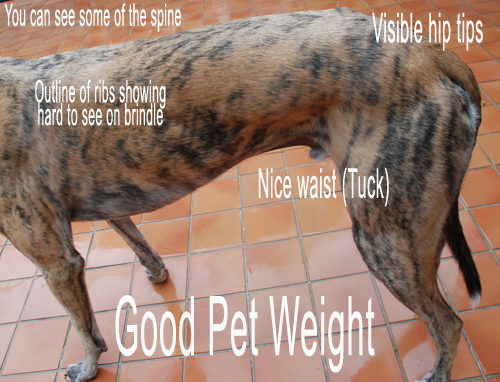 Not all vets are familiar with racing, fit, greyhounds, so they may not tell you to take weight off your greyhound until it is already obese. Just because your vet tells you your greyhound looks "OK" doesn't mean it really is at the optimal weight for a healthy fit greyhound. A couple of lbs under ideal weight is better than a couple of lbs over unless your dog is older. It is hard to keep weight on most senior greyhounds. 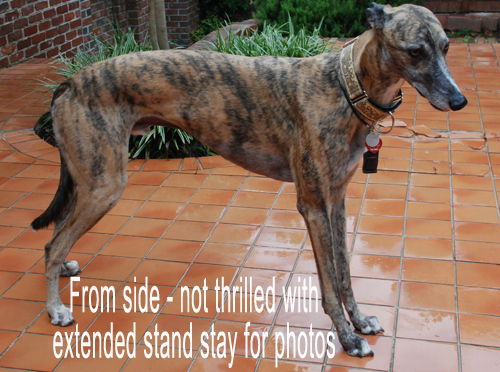 This is a 78lb tall, narrow greyhound that is 30" at the shoulder and is at the proper weight for his build. It is easy to get a dog overweight without even realizing it. When you see an animal every day, you may not even notice as the pounds add up. What do you do when you suddenly realize that your greyhound has accidentally gotten overweight? Check with your vet to rule out a health problem first. They can rule out metabolic problems, give you suggestions and make sure your greyhound is healthy enough to start an exercise program. If you are free feeding your greyhound... stop. "Free feeding" is when a bowl of food is left out all day so your dog has constant access to food. Like humans, greyhounds will be tempted to snack more when food is always within reach. It is better to feed regular meals so you can control how much your dog is getting and cut back when necessary. Cut back on your greyhound's food to slowly get it back to a good weight. You are likely to get the sad hound eyes, but don't give in. Love your dog enough to do what is best for its' health, even if you prefer not to see bones on a dog. Resist the temptation to fatten up a greyhound, even if you prefer dogs on the pudgy side!! How much do I feed? First of all make sure that the cup you are using is an 8oz measuring cup, and not a larger cup or scoop. Most male greyhounds weigh 65 to 78lbs and do well on 2 cups of food fed twice per day (4 cups total per day) for maintenance. If your dog is fat, you will need to feed LESS than this for awhile, to get the weight off. Smaller females may need only a cup and a half of food, or even less, fed twice daily (3 cups total per day) to maintain their weight. They would need to be fed even less to lose weight. A larger male or greyhound that gets a lot of exercise every day may need a little more food than average. We are talking bigger by racing weight, not bigger because of over eating. If your dog has been gaining weight on what you have been feeding you must cut back well BELOW what you have been feeding and a little below your dog's maintenance level to get weight loss. Cutting back only to the mainenance amount will just make him stop gaining weight, but will not allow him to lose weight. Once your dog has gotten to a good weight, the best way to keep him there is to do a daily hipbone and rib check and cut back on food a little as they start to disappear. Note: Fat rolls do not count as the outline of ribs! Pay attention to treats and things you add to your dog's meals. Adding a large milkbone or a handful of treats every day can be equal to a half a cup of additional food or even more. If you give lots of treats you will have to cut back on the actual meals to make up for it. If you add half a can of moist dog food to your kibble or half a cup of yogurt, be sure to cut back on the amount of kibble by that much. Low calorie treats like carrot sticks are better to use for treats than high calorie, high carb milkbones and cookies. The food you are feeding can effect your dog's weight nearly as much as the amount you feed. Feed less of rich foods, because of the calories. You may also need to feed less of the cheaper foods, because of the high amount of carbs from rice, wheat or corn that may be used as a cheap filler. High quality meat protein builds muscle for dogs. Carbs can make your dog flabby just like they do with humans. This is why the so called "diet" foods often don't work very well to help your dog lose weight. They have too many carbs, even though there may be fewer calories. It is better to feed less of a higher protein food than to feed a high carb, lower calorie food. Some people find it helpful to add low salt canned green beans or canned pumpkin (not pie filling) to their dog's food. These are both low calorie, fiber rich foods that will make your dog feel more full without putting on the pounds. Exercise is important for weightloss too. Getting more muscle on your dog is important, since muscle burns more calories than fat, even when the dog is resting. Greyhounds are famous for being couch potatoes and getting no exercise at all is not healthy and is likely to cause them to look like a potato. Medium sized male at racing weight of 75lbs. Perfect! At 83lbs You can really see how wide he is when he is laying down.